Inventory We are a resale marketplace, not a box office or venue. Ticket prices may exceed face value. This site is not owned by Ak-Chin Pavilion . 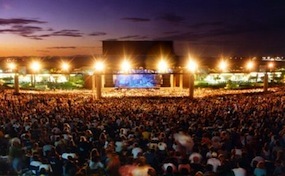 The Ak-Chin Pavilion was built in 1990 as the premier outdoor venue in Phoenix, Arizona for all the marquee summer concert tours. Many refer to the amphitheater as the Ak-Chin Pavilion and for many years was the Desert Sky Pavilion. The Ak-Chin Pavilion box office can seat 8,000 under the pavilion roof and has room for an additional 12,000 on the hillside lawn. All of the major traveling tours make there way to the Ak-Chin Pavilion as a mandatory stop. Recent Ak-Chin Wireless Pavilion tickets have included Aerosmith, Kiss, Lil Wayne, Rush, Dave Matthews Band, Kenny Chesney, and Billy Joel (who was the inaugural performance for the venue). Any seat is a good seat at the Ak-Chin Pavilion because there are several video screens available to the lawn customers. Formerly known as the Desert Sky Pavilion, the Ak Chin Pavilion was opened on November 11, 1990 with Billy Joel as the venue’s inaugural performer. The current sponsor is The Ak-Chin Indian Community although the facility is not located on tribal land. It is widely known by performers, so much so that both Fall Out Boy and Green Day recorded live albums at the theatre. More recent popular performers that make this pavilion an iconic stop on the tours include: Lana Del Ray, Fall Out Boy, Paramore, Zedd, Ozzy Osborne, and Blink 182. PavilionPhoenix.com is not a primary box office, website, or official supplier. We are an independently owned and operated company that provides access to the low prices and a large supply of inventory in the secondary market. Our prices may be well above or below face value and fluctuate daily. To order your tickets for all Ak-Chin Wireless Pavilion events simply just click on the performance of interest or pick up the phone and call our operators at your convenience.